Since I was in Downtown Orlando again and remembered my previous experience at Gino's Pizza, I couldn't wait to try it again. Take note Big Jim when I say, that this pizza is superb, and if you ever choose to go to Dan's Midnight Pizza, no matter how drunk you are over this place, you are nuts. 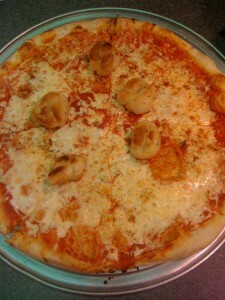 Gino's Pizza is located on 120 S. Orange Ave, 888.892.3666. Last year you might remember me saying how awesome Gino's was in Orlando. 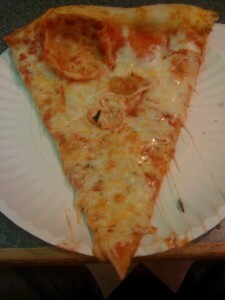 Well for the second year in a row, I am declaring them the best slice in downtown Orlando. Big Jim, Nick and I went there for lunch. We ordered a large pie, which comes topped with some Garlic Knots. 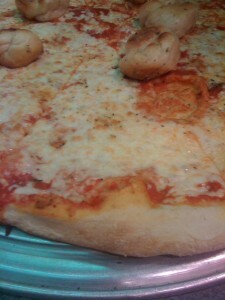 The pizza tasted delicious, and the fresh cheese, which they grate right in front of you melts in your mouth. The sauce was smooth and sweet tasting, and the crust was just perfect. Gino's says that they were voted the best pizza in Florida. I can believe this statement for Orlando, but not for all of Florida. Places like Kitchenetta, and Tucci's, as well as Nino's are far superior. Gino's unlike any of the other places I just mentioned is also opened 24 hours. Life does not get much better then this for a pizza connoiseur, unless you are one of the employees who actually has to work overnight. I believe this is the same owners as the other Gino's in Miami, which I also like very much when in South Beach. Both Big Jim and Nick equally agreed this place was amazing after trying it. One downfall to Gino's Pizza is that they charge $3.99 to deliver their pizza. And as their website says FEE SUBJECT TO CHANGE AT ANYTIME. I never like that type of statement. So if they feel like charging you $9.00 one day, that means they can....be careful. Gino's Pizza in Downton Orlando gets 6 out of 8 slices.